Welcome to The WW2 Zone. I have been wargaming WW2 since starting playing with my good friend Mark Bevis on his doorstep with unpainted Heroics & Ros micro-armour back in 1977. 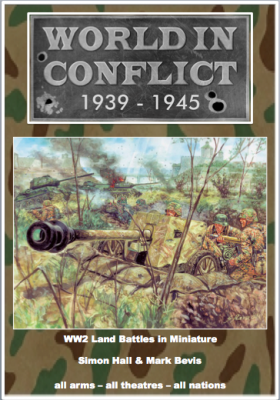 Mark has since made a name for himself in WW2 as the creator of Micromark lists – 1000s of the best lists for WW2 (and fine Napoleonic ones) on the wargames vault. a competition set for forces of 2-4 companies a side with suitable speed methods to allow games to finish in 212 hrs. a simulation set which will allow those of you wanting to do refights or who game with less time restrictions to have the best possible simulation of WW2 warfare. The rules have all the character of the varied troop types, arms and equipment, vehicles and command structures of the period. As I write this in late 2018 they are in final testing and will go to print after a beta test competition in the UK in January 2019. The rules will feature the fantastic artwork of Giuseppe Rava. Testers are liking the pace and feel of the game, and here in the Cape we recently played a 10 player refight of the Battle of Rauray, July 1st 1944, in 15mm on a 10′ x 8′ table. For now here is an overview chapter from the rules for information and some photos from our refight of Rauray in the Cape – which played very historically with A company overrun but British artillery stalling the German breakthrough. You can follow the new on the World in Conflict Facebook page.